Given what we now know about the Libbey Glass Company, the foregoing statement is a surprise. It contains the only reference in Fauster’s book to what, today, is usually called “figured” blanks. It might be thought that the author was engaging in a cover-up in the quote because he directs attention to “some factories” without mentioning Libbey’s own role in the use of “figured” blanks. That role, which was significant, is not entirely clear even today. It is hoped that this file will stimulate discussion of this important topic. At the time Fauster’s book was written, during the 1970s, the attention of knowledgeable dealers and collectors was increasingly directed to the “figured” blanks that were frequently encountered in the marketplace but were seldom identified as such. It is not a new factor in the collecting of cut glass. Daniel had discussed the subject as early as 1950. Nevertheless, as a subject of discussion the “figured” blank was a somewhat sub-rose one in the 1970s. Even the American Cut Glass Association, which was founded in 1978, held its council on the subject for several years. Carl U. Fauster spent his career on the business, rather than the technical, side of glassmaking. Although he had access to the extensive collection of Libbey glass that is now housed at the Toledo Museum of Art, it is likely that he unintentionally passed over the evidence of “figured” blanks in the Museum’s collection because of his ignorance of the subject, a more appealing suggestion than one involving a cover-up. K. M. Wilson (1994), on the other hand, who has discussed the same collection in detail, has described several examples of “figured” blanks that can be found in the Museum’s collection of Libbey glass. Regrettably, Fauster’s lack of attention to “figured” blanks has given rise to the myth that the Libbey Glass Company never used them. As suggested at the end of this file it would be a worthwhile project to assemble a register of all of Libbey “figured” blanks — a difficult, but not impossible, task. 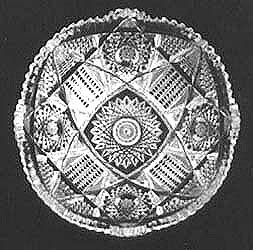 The following two images are oblique views of a 9″D berry or salad bowl whose pattern-name has not yet been discovered. All of the major miter cuts in this bowl were “pre-formed”, as were the raised centers of the hobstars, including the central hobstar. Distortions (“flow patterns”), noticeable in the uncut area of the blank near the bowl’s rim, indicate that the rim’s scallops and notches were also moulded. Only the rim’s bevel appears to have been hand-cut. The following photographs give the reader some indication of the expertise that was brought to the cutting of the motifs contained within the bowl’s pre-formed miters. It is no exaggeration to state that the high-quality cutting on this bowl compares favorably to that on Libbey’s famous “St. Louis” punch bowl (1904), which is best seen on the dust jacket of Revi’s book (1965). 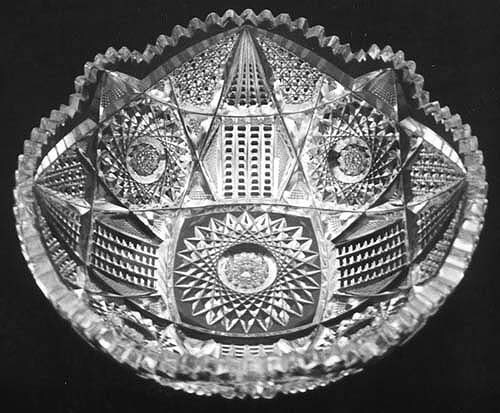 Like that masterpiece this bowl also uses double Brunswick stars (note 1), a motif that is not often seen on Libbey’s cut glass. 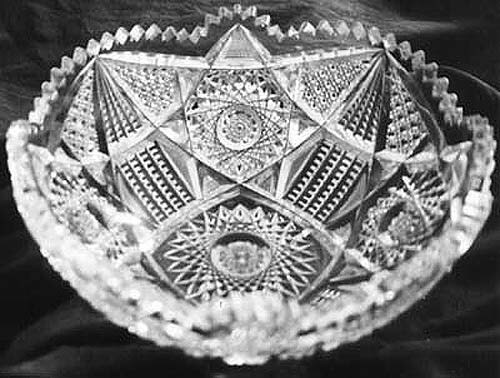 These uncommon stars have been cut on the hobnails of the bowl’s four main hobstars and on the central hobstar, and, as can be seen in the photographs, they are crisply cut, a characteristic that is typical of the company’s quality cutting at this time. The miniaturized cane cutting also required a high level of expertise, especially because no double-mitered (ganged) wheels were used to cut the cane’s paired miters. 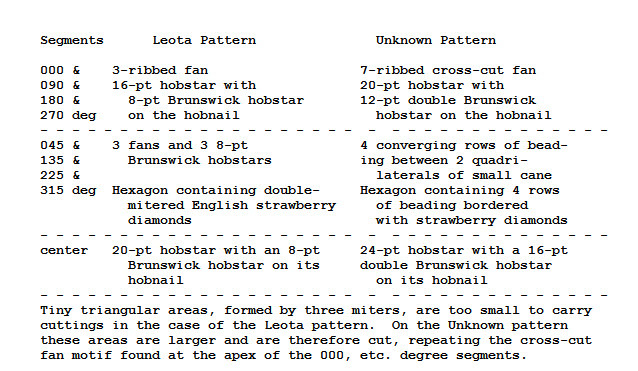 It is assumed that the Leota pattern, below on the left, probably was produced only on “figured” blanks because (a) all of the items cut in this pattern that have been examined to date have been cut on “figured” blanks, and (b) for at least a short time — presumably when the pattern was first introduced — it was not signed, which would have been a radical departure for the company at that time. Possibly the company first wanted to “test market” its “figured” blanks before admitting them into the family! Leota was introduced together with two other patterns, Elmore and Sunset, each with similar restrictions. Several examples of the Sunset pattern have surfaced on “figured” blanks. At some time, presumably somewhat later, Libbey began issuing Sunset with an acid-etched trademark. Perhaps the other two patterns were also “signed” then. Cut Glass Association in co-operation with the Toledo Museum of Art, 1996. The Leota pattern is shown on shape no. 36, a 7″D plate with a list price of $5.00 (c1905). There is no doubt that a “figured” blank, identical in design to that used for the Leota pattern, was also used to produce the “unknown” pattern — a plate in the former case, a bowl in the latter case. However, it should be noted that Libbey also used identical “mitered patterns” for some of its non-figured patterns, patterns that were differentiated only by the motifs selected. This is clearly seen in the case of patent nos. 33,909 and 33,910 (Revi 1965, p. 34). 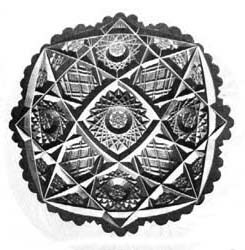 These patterns, Sultana and “Silver Diamond”, have identical “mitered outlines” that possibly were never figured because to date only fully-cut examples have been found. They were conceived five years before the appearance of the “figured” patterns analyzed here. Converging evidence suggests that Libbey did not begin to use “figured” blanks extensively until c1904. It is ironic that in this year of the Louisiana Purchase Centennial Exposition in St. Louis, MO — with Libbey’s cut-glass triumphs on display — the company decided to venture onto the slippery slope of expediency. Such is the pressure of economic reality! NOTICE: At the present time a digital image of the nappy is not available. When one becomes available, it will be placed here. Nevertheless, the pattern is clearly shown in Pearson and Pearson’s DISCRIMINATING book (p. 137), reprinted in Pearson’s ENCYCLOPEDIA (Vol. 2, p. 154). The pattern is also shown in Boggess 3 (illus. 642), but the photo if of poor quality. The mitered outline of the central, five-pointed star. Punties which are used for each of the five lobes that form the five leaves present at the apexes of the star figure. Mitered leaves (splits) arranged in five sets of three splits each between the star’s five points. The splits merge into shallow miter cuts that are not “figured”; the resulting “joins” are clearly visible. The nappy’s rim appears to have been molded but it contains a hand-cut bevel. The writer has had a slight softening of his position regarding “figured” blanks since he took example no. 1 to task in November 1998 and destroyed it. Example no. 2 (which is really quite handsome) has been retained in the inventory of his Littleshop, where its price, $60, clearly reflects the nappy’s “figured” nature. Because “figured” blanks can frequently be found among the products of the Libbey Glass Company, readers are encouraged to report them to this writer. Now that a considerable amount of archival material for the Libbey company has been made public, it should be possible to remove much of the secrecy that surrounds the use of “figured” blanks by this company, as well as to evaluate the importance of Libbey’s “figured” blanks from a perspective of a hundred years. 1. An 8-pt double Brunswick hobstar is shown, below on the left, together with an 8-pt standard (or single) Brunswick hobstar for comparison. On the Libbey bowl with the unknown pattern 12-pt double Brunswick hobstars (16-pt on the central hobstar) are used on the hobnails of the principle hobstars. The diameters of the hobnails on the “side” hobstars do not exceed 0.8″ (20 mm); on the central hobstar the diameter of the hobnail is one inch (25 mm). All of the double Brunswick hobstars are cut with precision, a marked achievement given the very small working spaces. Did the master cutter of the “St. Louis” punch bowl, John Rufus Denman, also cut this bowl? The Brunswick star motif is discussed in the motifs5.htm file in Part 1. 2. The acid-etched trademark, found on the inside of the bowl near its rim, is an exact replica of the no. 3.1 trademark illustrated and discussed by Wilson (1994, p. 843) — Libbey with L and Y tails not joined, and with the so-called short sword, that is, one with a length of about 1.0 cm. The top of the sword’s hilt is in close proximity to the loop in the letter L. According to Wilson this trademark, with slight variations, can be found on glass as early as 1896, when it was registered, and as late as c1906 and “possibly as late as 1910” (Wilson 1994, p. 841). Several items known to have been exhibited in St. Louis in 1904 carry this trademark.